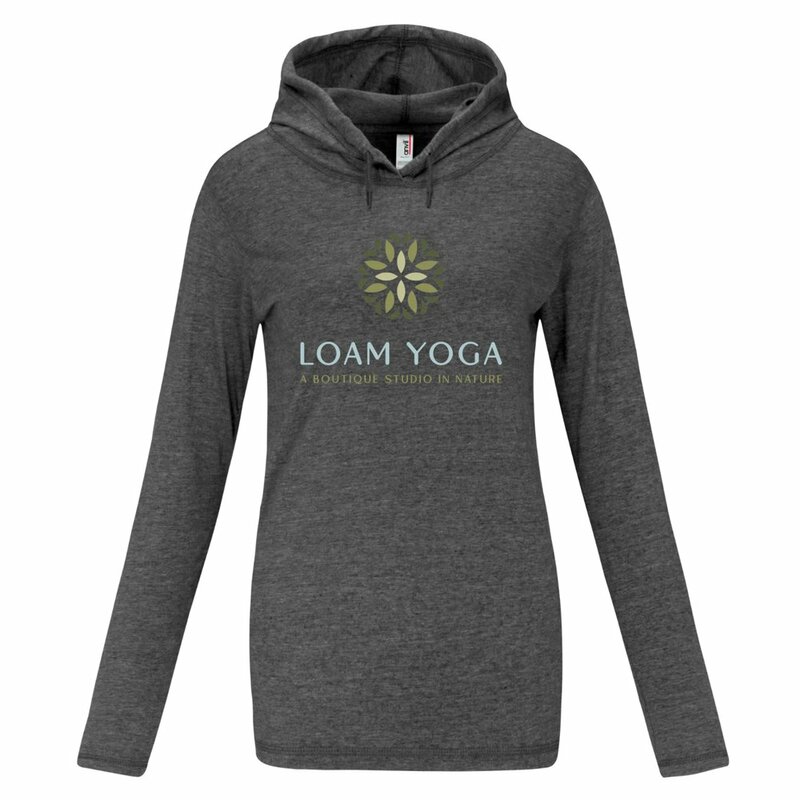 Loam Yoga Merchandise has arrived! Check out these great tanks, Ts and water bottles! The Loam Yoga merchandise arrived on my doorstep just the other day. As I opened the box, I was a little nervous that they might not turn out the way I hoped. I am very pleased to report they look great! Thank you so much to the lovely and talented Anna Oldfield for designing such a beautiful new logo for Loam. She is equally as talented a designer as she is a yoga teacher. There is so much depth and meaning in this logo. You'll notice the mandala incorporates aspects of nature via earthly colours and leaf symbols. Anna beautifully integrated key qualities of Loam Yoga into the logo: our connection to nature, our connection to community, and our connection to our deeper and higher self. Mandala is Sanskrit and represents "circles". It symbolizes unity and harmony and wholeness of self. The mandala aligns beautifully with Loam Yoga's mission statement of being a place to Connect, Strengthen and Restore. As outlined on the main page of our website, yoga helps us build deeper connections to our bodies, intuition, environment, and to others; it enhances our relationships and makes them more meaningful. Loam Yoga is a welcoming and intimate community-based studio. It is a place to create positive connections with like-minded individuals. Studies show, the more connected we are with ourselves and with others, the happier and healthier we become! Thank you for the wonderful community and connection you have created at Loam Yoga! I've been wearing the Loam Yoga thanks in class and many have been interested in purchasing. I thought you might be interested as well so I am decided to email you with all the options available. I will be placing a group purchase by November 27th. Please take a look at the options below. If you are interested in purchasing, please email me (loamyoga@gmail.com) with your details on or before November 27th. Aligning with the goal of community connection, Loam Yoga will be donating 10% of all proceeds to the Tri-Cities Homelessness and HousingTask Force. The lovely Polly Krier, fellow Loam Yogini and Anmore Councillor is a key member of this task force. I will be coordinating with Polly to get the donations to them in time for Christmas. As you review the products and pricing, please keep in mind that Loam Yoga is a small studio that does not receive volume discount wholesale pricing. The price point selected essentially covers the cost to produce the product with only $2-3 profit after 10% is given to charity. Stay tuned for really fun Hughes Family photoshoot, pictures courtesy of my young son Cayden! They are quite funny! As always, thank you for taking the time to read this article.